The rain continues, and the temperature has dropped to 5 degrees now. A lot chillier than what we are used to, but it’s nice and cosy on board. So after tucking into a substantial breakfast and filling up on warming coffee, we headed to the lounge for a lazy morning. Nothing was planned for this morning apart from sailing. So many took advantage and enjoyed a lie-in or like us relaxed in the lounge catching up on reading or Facebook. Even though breakfast had only finished serving at 10 am, when lunch was served at 12 pm, people were queueing up to be fed. Not sure if they were hungry or just looking for something to do. 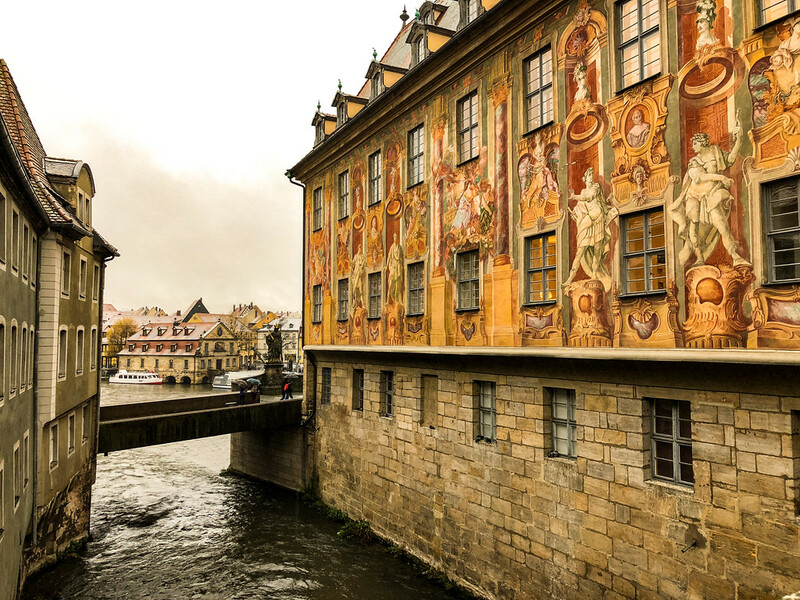 At 1.30 pm, the ship had moored, and there was an option of exploring the nearby town of Bamberg. The weather didn’t look good; the town was a little too far away to walk to, should we bother? Also, as soon as people had disembarked, the ship would be moving on, and we would have to be bussed to meet the ship further down the river. What to do? Although it was raining heavily and far colder than we would have liked, we opted to go into town and I’m glad we did. The town was incredibly pretty, but it was far too cold for us (well, definitely too cold for me) to join the included walking tour. 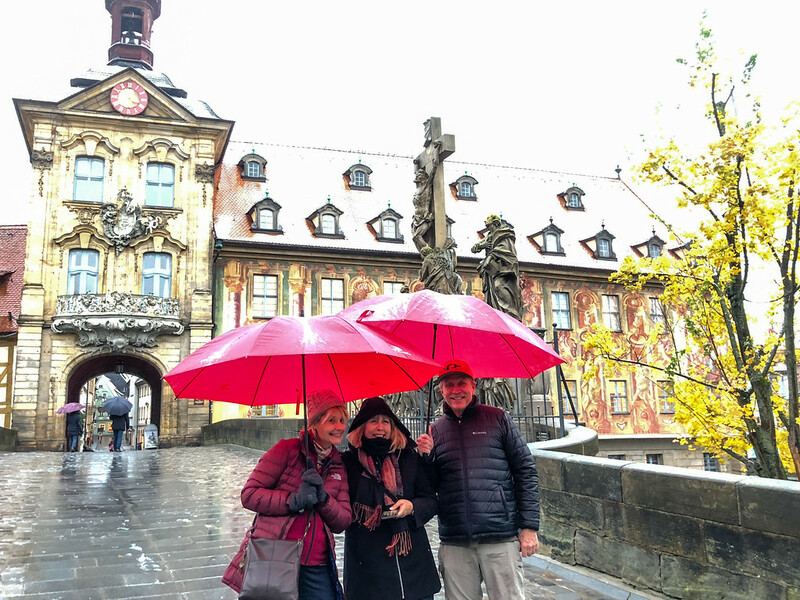 So instead we took advantage of being bussed into town, then walked across the bridge into the charming old town, passed the picturesque city hall built on a small island in the middle of the Regnitz River and headed to the nearest brewhaus. Rauchbier! It tastes a bit like smoky bacon, and who doesn’t like smoky bacon? The town is famous for its rauchbier which means ‘smoke beer’. 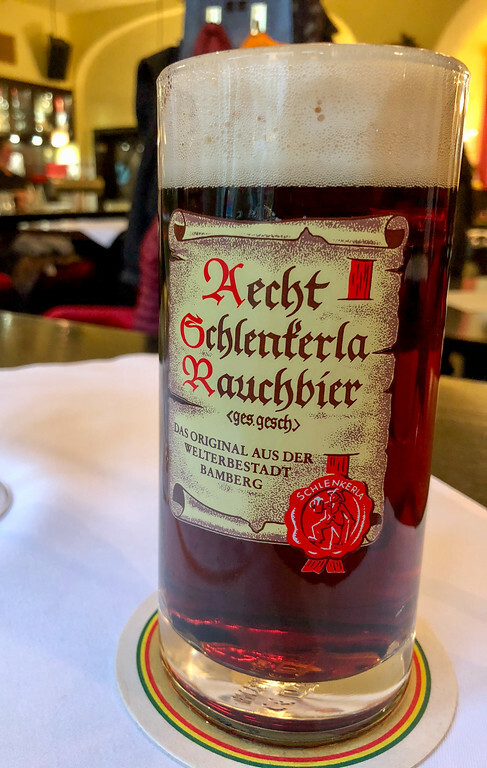 At one time, all beers were rauchbiers. The original kilning methods of drying green brewer’s malt over open fires caused the grains to absorb the smoky flavours. Jon certainly enjoyed a couple of the rauchbiers, but I found the mulled wine far more to my taste. 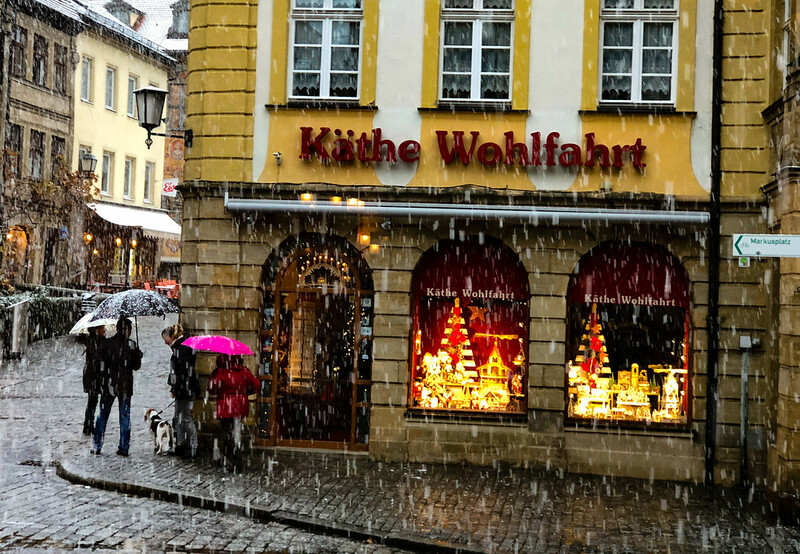 As we enjoyed an afternoon in a local Bavarian bar, it started to snow outside and settle. I can’t remember the last time I saw snow; it was rather exciting and quite magical (but freezing). We headed back to catch the bus to the ship at 4.30 pm, the sun has already set, so already dark and it felt so much later than it actually was. Relaxed for a while before enjoying dinner. Best vegetarian cannelloni meal I have had in a long time and Jon, unable to decide on a starter, had all of them, well, why not? After dinner, we got into teams for quiz night. But this is quiz night with a twist, here’s a couple of the questions, can you get them? 1) How many S’s are there in the longest river in the world? 2) A family of 3 – Mr Bigger, Mrs Bigger and their son. Who is the tallest and why? On that note, I’ll say goodnight. Ok, smarty pants, how many animals did Moses take onto the ark?